No Hope Here is a hilarious farce written by local author Vivian Brennan and presented by the Belvoir Players. 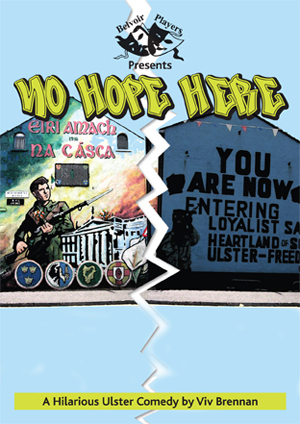 No Hope Here – a hilarious Belfast comedy peformed by the inimitable Belvior Players. It will show in the Great Hall at the Downshire Estate on Saturday 27 and Sunday 28 April at 8pm. Through mis-using Housing Executive Improvement Grants, Rab Devlin, a streetwise householder on the peaceline fears detection. He hatches a plan to claim intimidation and thus avoid paying back the grant money and going to jail. As this is around the time of the IRA ceasefire, he finds himself in a no-way-out situation when the Loyalists, the Republicans and the RUC, who are all keen to keep their PR in good order, decide to protect him unto death. Add to the mix the Housing Executive who are equally eager to do him a favour, plus his drinking buddies who muster volunteers to protect him, and you have a potential confrontation of near-nuclear proportions when their various representatives assemble in his home on the fateful night when fantasy and reality finally collide. This show provides a lighted-hearted look at Belfast people who know how to laugh at themselves. A MUST SEE!!! 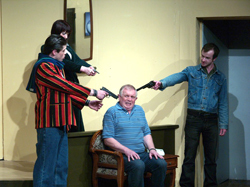 Belvoir Players are renowned for their treatment of Sam Cree Ulster Comedies which they played for many years in The Group Theatre in Bedford Street to high acclaim. They have toured throughout Ireland, England, Scotland and Wales and have even ventured as far as Florida in the United States.